Just a flying stop by the office to grab the camera and a set of the Single Site wines – showing them today to a wine collector from Texas and a group of his Barossa-interested friends – but don’t worry, I’ll be back later with the full rundown from yesaterday’s Legends Lunch at St Hallett. What a day out. If someone has come to the Vintage Festival this year and not had a top time as well as far too much value for money – then they’re far too hard to please! It’s a bit drizzly for the float parade this morning, but seeing as official start time isn’t till 11am, hopefully it will lift. I’m off to the float marshalling area to try and get some photos of our troops on the Yalumba 50 Years of Signature truck – hopefully not too soggy already. PS I ran into Di Koch down the street yesterday morning, and they were picking their Muscat Rouge for us – officially the last fruit for the 2011 vintage. Tell you what folks, I’m getting used to these crispy clear Indian summer Barossa mornings. Another very memorable Vintage Festival Friday coming up! I know that on the other side of the world they’re all getting into a serious frenzy about William and Kate getting married at Westminster Abbey – and that’s great. Our small band of talented people at the London office have today and Monday off to celebrate – the Jansz is in the fridge, the Union Jacks with the happy couple picture on them are ready to wave at the telly – and that’s great. We wish them all the best. 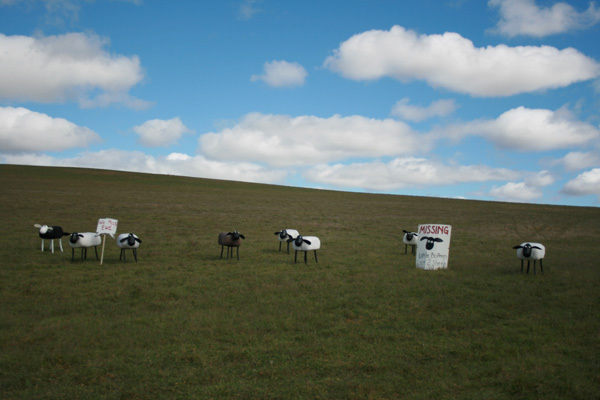 But just quietly, today we’ve got our own high-profile event on in the Barossa that we’re a bit excited about. On the southern side of Tanunda you’ll find Krondorf Road, the address of several talented winemakers – Charlie Melton, Rockford and St Hallett for starters. If you happen to drop in to St Hallett at around 2 pm this afternoon, you’d see one of Australia’s great storytellers in full flight at The Legends Of Lunch: Peter Fitzimons. He’s played rugby for Australia, written a stack of fabulous books on various Australian historical moments like ‘Kokoda’ and ‘Tobruk’; as well as stories about several Australians. One of my favourites is on Les Darcy – the world champion boxer they say died of a broken heart. And guess who’s bought a ticket for that lunch today? Yep – that would be me. Young Stuart Oldfield is doing the catering for lunch, matched up with a whole dose of St Hallet wines – some of them museum releases. What a treat. 1 x 6 litre imperial of the 2006 Henschke Hill Of Grace Shiraz – as yet unreleased vintage from the old ‘grandfather’ vines opposite Gnadenburg Church. The Ultimate 100 year Old Experience – From Seppeltsfield – 4 x 375 ml bottles of Para vintage Tawny – vintages being 1990, 1961, 1911 & your own birth year. The successful bidder gets to take the empty bottle plus 3 friends up to Seppeltsfield for a tour and taste whilst your birth year Para is drawn and bottled. See folks – special stuff and it doesn’t get much better than that for wine lovers. The bids start to fly at 10am. 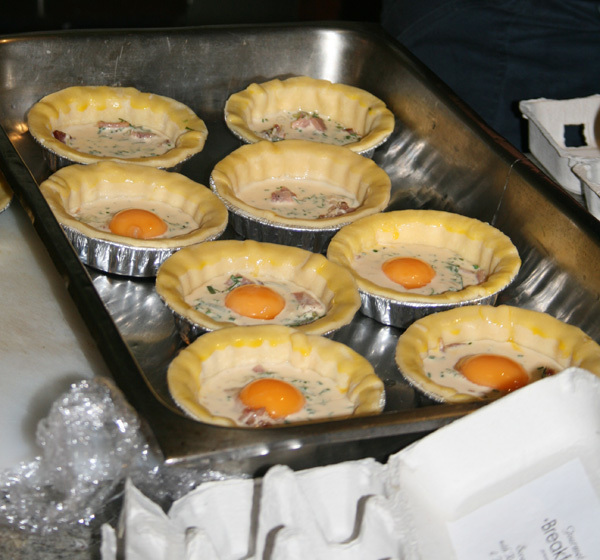 And speaking of breakfast – here’s what I reckon have been two of the big winners from various morning events around the Barossa Vintage Festival this last week. I’m a big fan of the brekky pie, and here’s the two best options I’ve seen for a good long while. 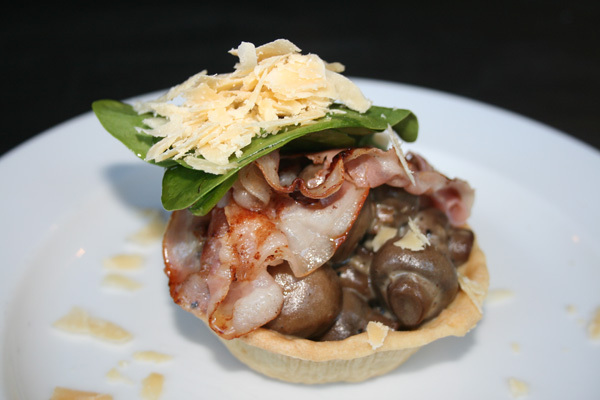 From Bobs Shed at the Yalumba Harvest Market – the mushroom and pancetta pie. 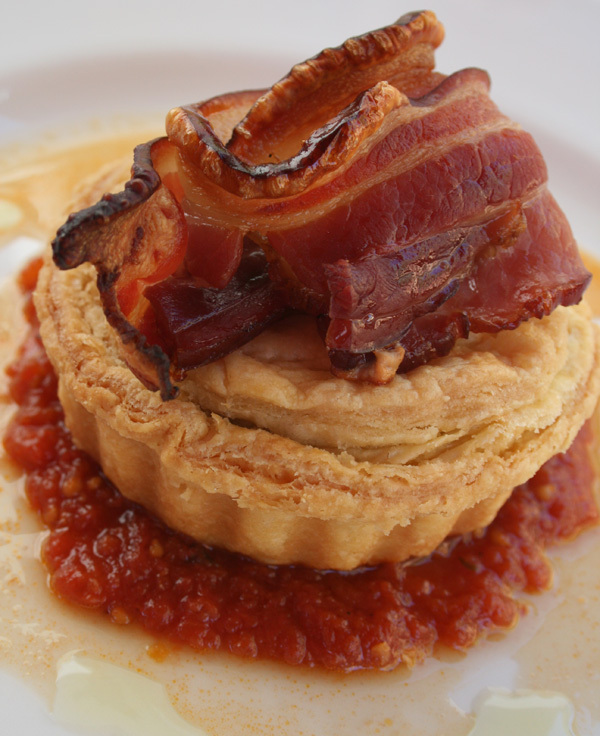 From the Rockford brunch – Sandor and Lauren’s egg and Linke’s bacon pie, where the flaky butter pastry was a star by itself! See ya later when I’ve soaked up what Peter Fitzimons has to say! Just wanted to let you all know that in a few years time, when some of the Barossa big red guns from the 2010 Vintage are released – all will be good. How do I know? No crystal ball required here folks, I just got back from a fabulous Vintage Festival event up in one of the BVE sheds on the Seppeltsfield side of the Valley – “Legends Behind the Barrel” – and a stack of truly charismatic and talented winemakers were showing a current wine from bottle, alongside an unreleased outstanding parcel of wine from barrel. There was a really big crowd of locals and tourists hanging on every word, because they were able to talk to the winemakers themselves – what a top way for a winegrowing region to throw their doors wide open to the people that drink and buy the wines. the Stonewell Shiraz from Peter Lehmann presented on the day by their teriffic young winemaker Peter Kelly. It’s a good thing that we had Kev Glastonbury down there with a little barrel of his 2010 Octavius and that it sat up nicely in some pretty scary good company. PS Also on show from Seppeltsfield – keepers of the Fortified Wine keys – was a stunning comparison of the 2010 base wine for their famous “Para” which will now not see the light of day for 100 years : and their 21 year Old Tawny. Lovely sweet fruit infused brandy spirit that I had a real job to spit out! Don’t take my word for it though, go out to that lovely old palm-surrounded building and have a look for yourself. You will not be disappointed. 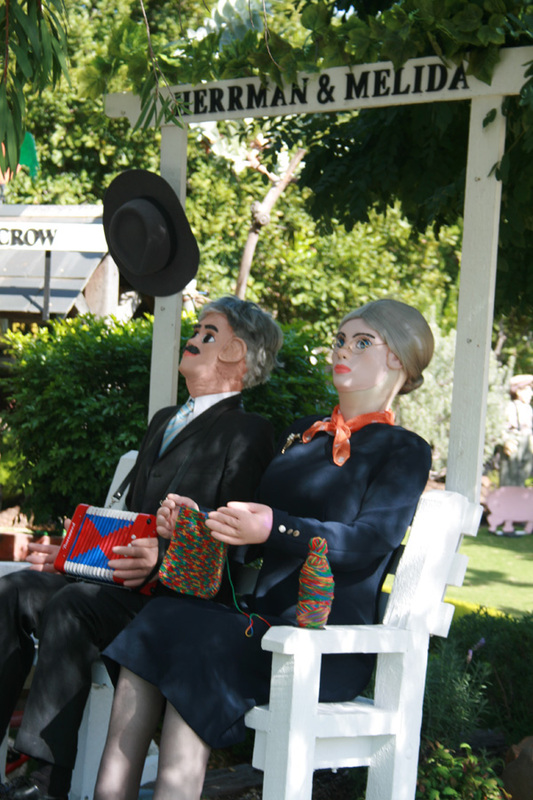 Well folks, it’s another blue sky morning in the Barossa – heading for 27 degrees and a top backdrop for the Tanunda Town Day – today’s major Vintage Festival event. I promised you a photo tour of the Harvest Market – Yalumba’s big two-day showcase of all food things Barossan – so here we go. 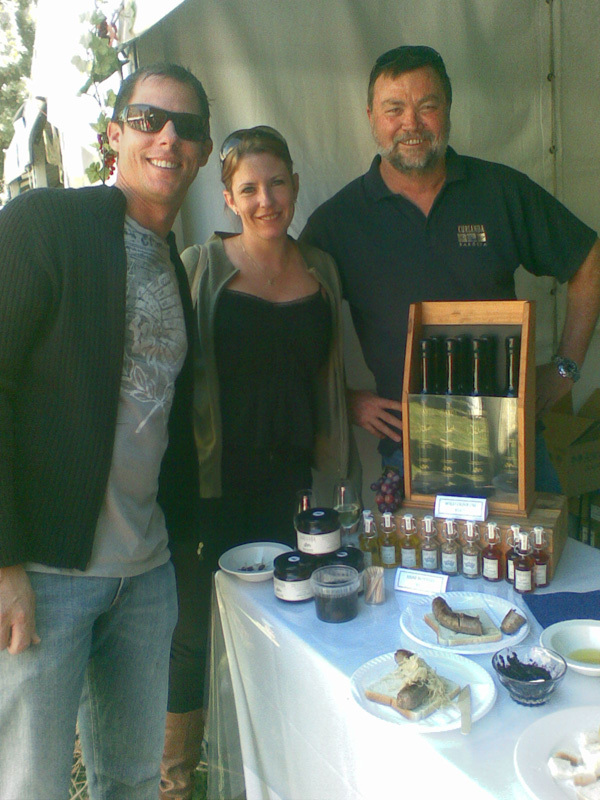 Here are my visitors for the day, Stuart and Janelle from Yorky’s Knob Boating Club up in Cairns – with Rolf Egert from Kurianda – famous for local wild tree olive oil, savoury shiraz sauce, and pear chutney. 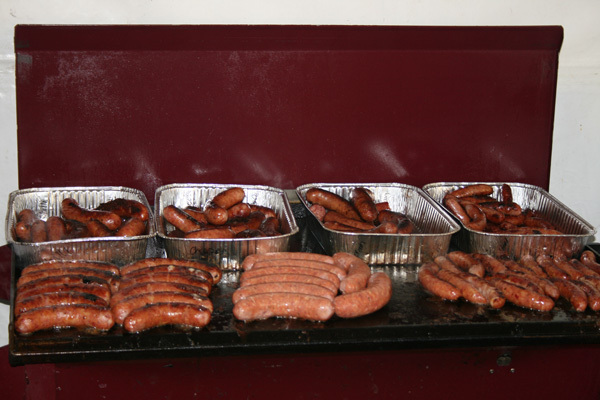 … and here’s the ‘after’ adding all the goodies picture, about 11.30am yesterday morning. 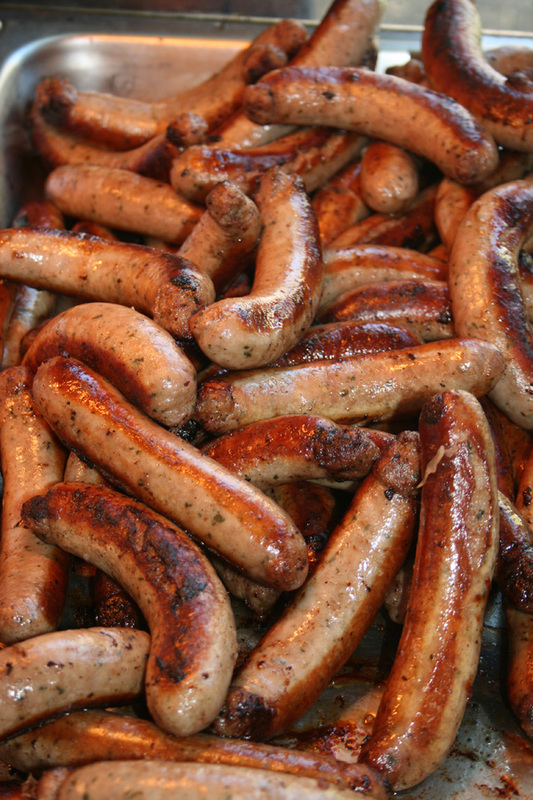 First, the meat – so good in this part of the world … Schulz’s bratwurst – the benchmark local sausage, Lyndoch Butchers kransky (you can smell those cooking!) 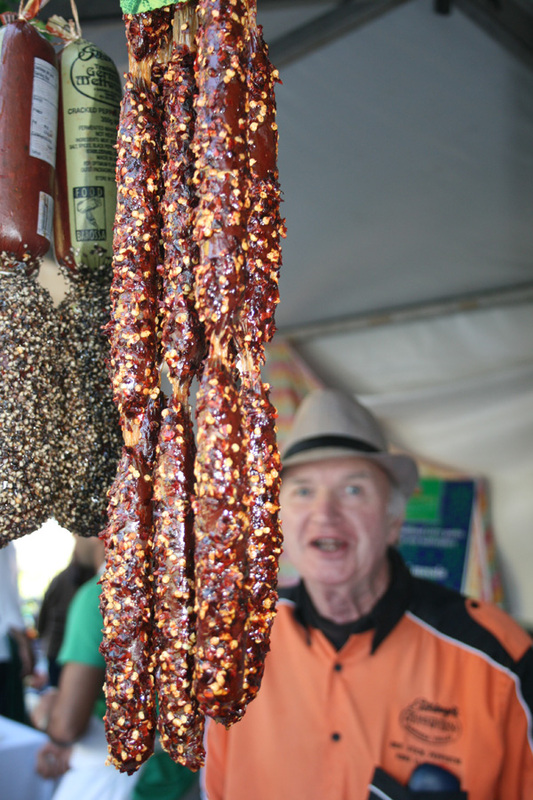 , and Steiny’s ‘The Afterburner’ – which is their legendary ‘Ring Burner’ pepperoni stick, dipped in chilli! Only for the brave palate or those who really like hot hot stuff! 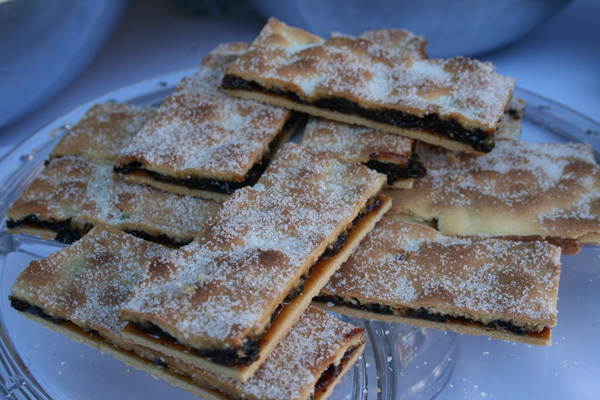 Then, the sweets … Barossa Country Biscuits currant wafers – only made seasonally, and as kids we used to call them ‘squashed fly bikkies’ because that’s what the middle looked like, but tasted like syrupy sultanas – tops! 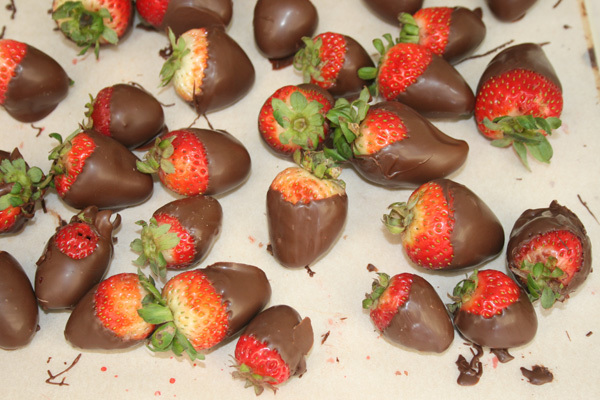 And possibly the bargain buy of the day – two local strawberries dipped in Bryan Pearson’s chocolate for one dollar! 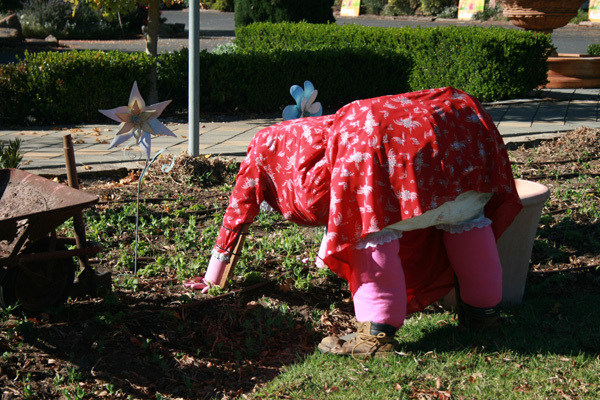 And hey – for the scarecrow scrapbook, here’s the ‘big mama in the garden’ outside the nursery in Nuriootpa and the wet weather bloke from Yalumba’s front lawn. We’re on Vintage Festival time! We’re back from the Easter break folks – kilos heavier from far too many hot cross buns with butter and homemade dried apricot jam – and we’re into the Barossa Vintage Festival program now with a vengeance. The weather has been sensational, in a word – blinding blue skies and 26 degrees for the past three days and by the forecast continuing right through to Friday. Now here’s the raspberry and choc chip (Cadbury choc actually!) Easter buns I was talking about last week. Are they not a work of culinary art? 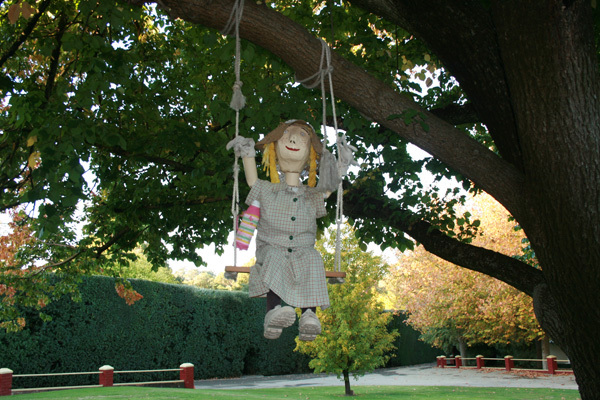 And for the scarecrow scrapbook – here’s the ‘swinging school girl’ from the front lawn here at Yalumba (above), and Pindarie’s sheep-crows from out on Gomersal Road. They were a bigger group, but as you can see two of them were ‘lifted’ and we hope to see them back soon. Now I have heaps to catch you all up on, but I have to fly right now, as I have a group of trade folks from Queensland about to arrive. 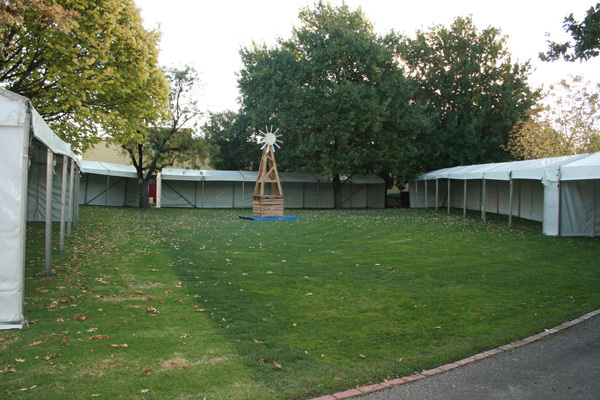 I’m showing them around the big Vintage Festival thing that we do – the Harvest Market At Yalumba. I’ll put up the photo story for you as it will be the easiest way to explain this fabulous event. 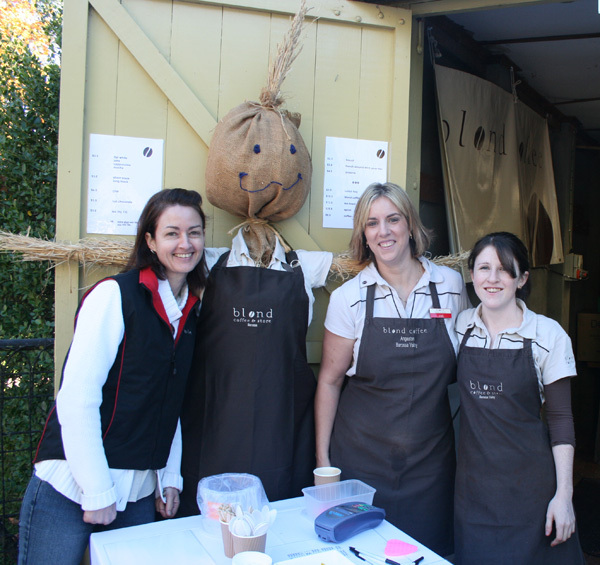 But for starters – here’s the crew from Blond Coffee – they’ve put a skeleton crew up here at the winery for two days whilst their home base cafe is flat out down in the Angaston Main Street – and this is how most folk are starting their morning right now. See ya a bit later! Morning folks – sorry I didn’t get to put anything in yesterday. I completely forgot that I was supposed to be off site at an all-day Barossa Grape & Wine workshop, so dashed off without a word. And for the record, yesterday was not the day to be away from the winery. The big chief (that would be Robert Hill Smith) put his Easter Bunny ears on and shouted the whole winery crew hot cross buns for being such good kids so far this year. Apparently there were mountains of buns from Sunrise (down the main street of Angaston), and the whole place smelled like fruit and spice for hours. What a lovely thing to do, leading into the big Easter / Start of The Vintage Festival Weekend. Now speaking about hot cross buns, I’ve been doing a a quiet comparison leading into Easter Sunday. Even though I’m a bit of a traditionalist, this year I’ve found a very special bun, and it’s from the Brumby’s Bakery people. 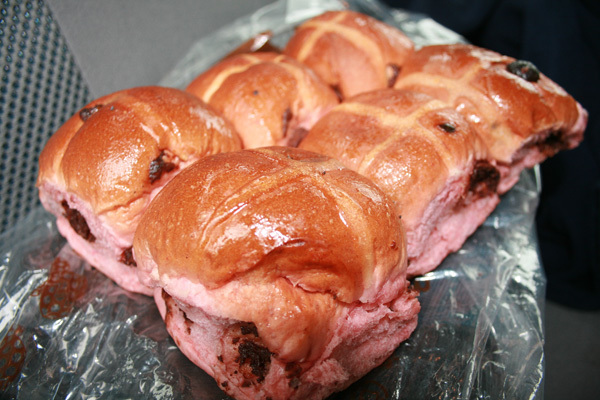 This is going to sound pretty gluggy – a raspberry choc chip hot cross bun – and I was a bit dubious at first – it’s very pink – but it tastes sensational! Fresh or toasted! Like a cherry ripe crossed with a fruit bun – no peel! I was going to put in a photo of it for you – but I couldn’t help myself. I ate it on the way to work. Also very high on the list are the hot cross buns from Apex bakery in Tanunda, but then they have the inside edge – they make the very best yeast currant bun in the world. Over the last 20 years I’ve compared, and that’s a fact! I ran into Kev Glastonbury (our maker of Barossa red wines) on the way into work and he was thrilled to bits, because with 5 tons of Grenache from the Waechter’s vineyard at the top of Kalimna Road – that’s everything through the crusher for him for Vintage 2011. He’s another one who is quietly impressed with a lot of the Cabernet Sauvignon from around the Barossa floor this year – it is certainly the variety that looks like it’s handled the unusual vintage conditions extremely well. And in the reds, Mataro – that’s Mourvedre, folks, same thing – isn’t far behind. 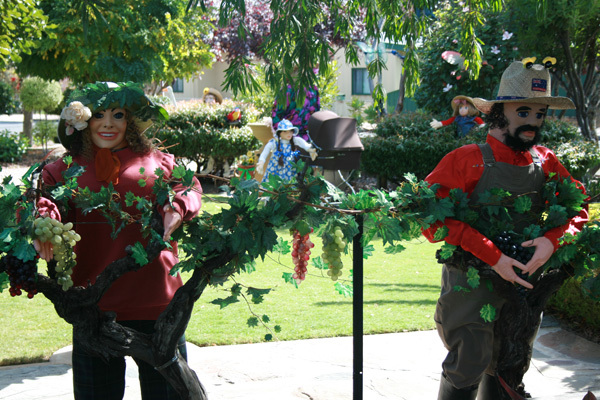 And on the scarecrow front – they keep popping up overnight. Here’s the WindyHill man at the bottom of Crennis Mines Road, and our very own ‘tin man’ on Vine Vale Road – almost to Kroemer’s Crossing. And speaking of the Vintage festival – looks like the weather is really going to do the right thing for the opening weekend. Today we’ve got a hive of activity all over the winery that has nothing to do with the Vintage 2011, and everything to do with setting up a marketplace on the side lawn for local producers and chefs, a picnic world on the front lawn for folks to enjoy everything from the side lawn, an outdoor breakfast cafe down by the Wine Room, a back vintage Rare & Fine masterclass, a cooking school with Stefano di Pieri … it goes on and on. And it’s all out there bathed in sunshine right now. 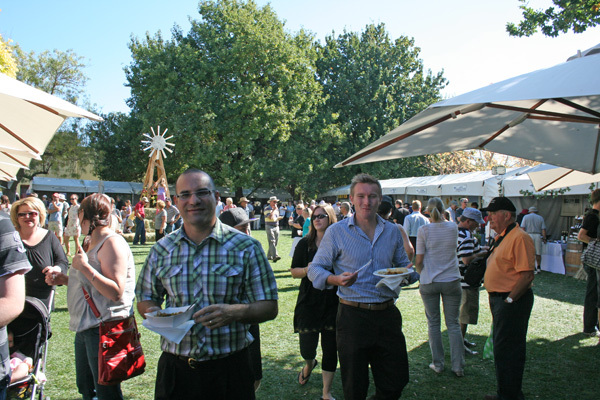 Come Tuesday and Wednesday – add all the producers, chefs, happy picknickers, some local folk musicians, all of us from the winery at one time or another – and you’ll have about 6000 or 7000 people enjoying some of the best that the Barossa can offer. Will I be there?Yes! Breakfast one day with the Schmidt clan, and looking after a whole swag of Queensland retailers on the other. Some days are diamonds … and it looks like Harvest Market Tuesday and Wednesday will qualify easily! Morning folks, and a nice clear sky, crispy cold, hot air balloons up over the Barossa morning it is. It’s very bright and breezy down at the weighbridge, as we see pretty much the end of the Barossa floor fruit with a bit of Grenache, everything else now from the cooler high country of the Eden Valley. There’s some Mataro from out Moculta way, and some Shiraz from Wilton – which is a tiny hamlet out on Flaxman’s Valley Road with a legendary dance hall. Once upon a time you couldn’t have an open container of alcohol within 200 yards of the dance, so the old cars were parked exactly that in all directions! Also in today are the individually hand harvested lots of the clonal Viognier plantings up on the Hill Smith Estate slopes opposite Heggies Vineyard. There are 7 clones represented at present – mostly selected at the invitation of the owners from what is considered to be the better Condrieu vineyards, with the vines between 4 and 8 years of age. The fruit from each separate planting is weighed off and fermented separately, with these ‘clonal highlights’ eventually ending up in either the Yalumba Eden Valley Viognier or the ‘big sister’ Yalumba Virgilius. 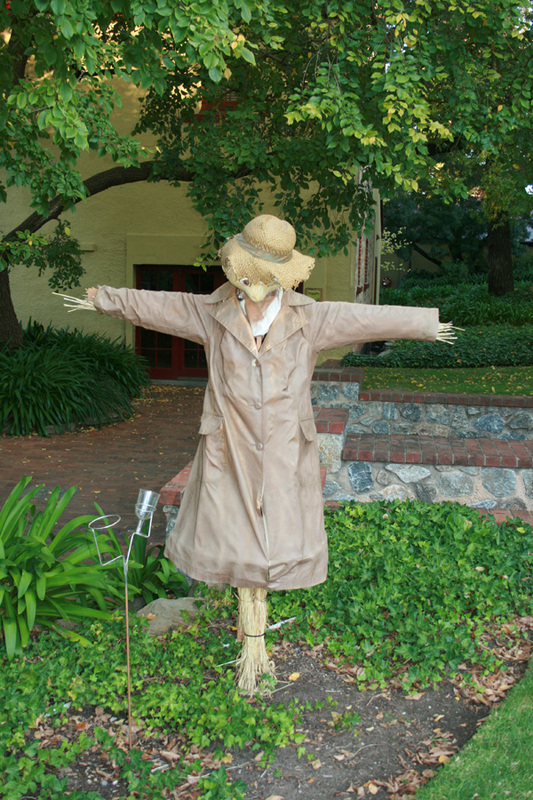 Plus we’ve seen a whole swarm of scarecrows pop up around the Barossa over the weekend like mushrooms. The judges are going to have a job this year picking the winner. 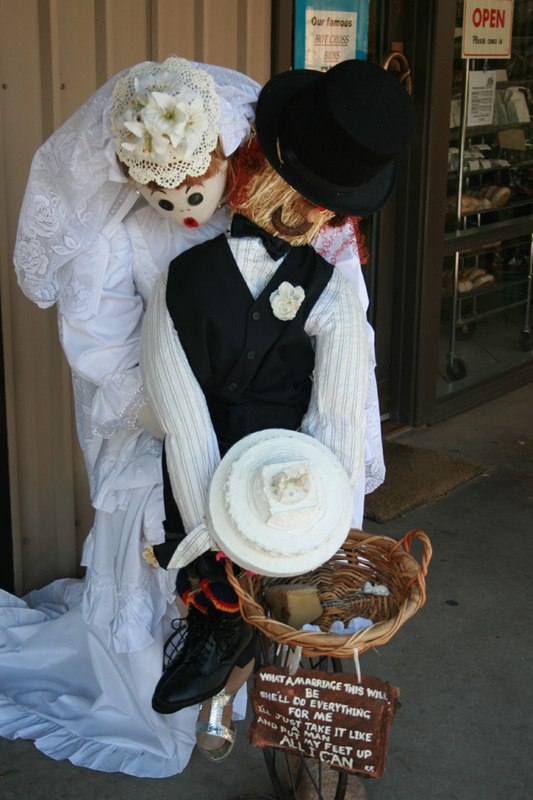 Here’s a few from down the main street of Tanunda – the grape pickers and the family, and the happy married couple from the Tanunda Bakery – obviously just picked up their cake!